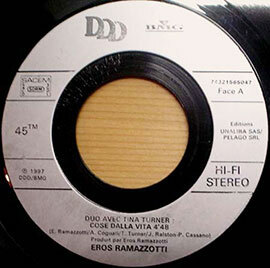 "Cose Della Vita" is a single from Eros Ramazotti’s compilation album "Eros". The song is a re-recorded version of Ramazotti. He released the song himself in 1993 and it was included on his album "Tutte Storie". Eros wrote the song himself together with some co-writers. Tina invited Eros to an anniversary party. Tina was already a fan of Eros and was so happy that he accepted her invitation. She played her favourite Eros song "Cose Della Vita" and added some English lyrics to it. Eros was excited and asked if Tina would do a duet with him. Eros invited Tina and in late 1997 they recorded their version of "Cose Della Vita – Can’t Stop Thinking Of You". The song is about somebody whose love affair has ended and he/ she can't stop thinking about the other. Eros and Tina shot a video for "Cose Della Vita". It was shot in the South of France and both were wearing a stunning black outfit. Eros also invited Tina to his live concert in Münich 1998 where they did the song live together. Their duet version of "Cose Della Vita" was released in early 1998 and was a huge hit over Europe. With almost 6.000.000 copies sold, the single was a better success for Eros than his solo version. Eros also released a Spanish version of the song and added Tina’s English vocals in it. The single was released in 3 formats. 7" single (very rare), cd single and cd maxi single. The song was later included on Tina’s official compilation cd’s "All The Best" (2004) and "The Platinum Collection" (2009). Tina and Eros were magic together and the song will be timeless forever. What's life without a dream to hold? "Cose Della Vita" - 4.48 min.